Guru Nanak has a place among the great prophets of the world who conveyed to the suffering humanity their divine message of love and peace, unity and tolerance, pure-heartedness and faith. His was a seminal personality, encompassing many facets of human perfection and glory. Of all religious leaders, in ancient or medieval India, probably it was Guru Nanak who left the deepest mark on the social and cultural life of the modern times. The enormous impact of his personality was felt far and wide, specially during the later part of his life. This powerful humanisitc influence, which was essentially of a spiritual and ethical nature, was brought about by his dramatic actions, his courageous confrontation with the regal and ecclesias­tical powers of his time and his extensive travels which took him to almost all the then-known world. Wherever the great Guru went, after the declaration of his divine dispensation at Sultanpur in the Panjab, his all­-absorbing, all-embracing holy presence was felt by all and sundry. He was like a touchstone that served as an ennobling, enriching force for all those human beings who saw him or heard his immortal word. In fact, his spiritual effect was so immediate and so far-reaching that to know him or to see him or even to hear or utter his name was enough to be eternally saved. 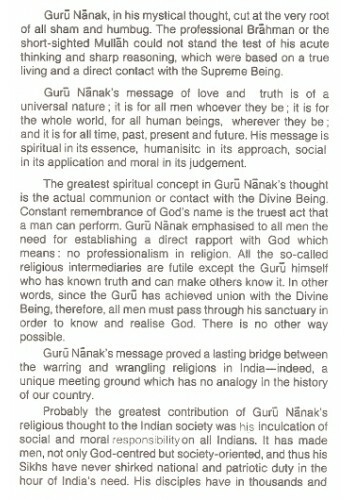 Guru Nanak was, undoubtedly, one of the great saviours of souls. His sole purpose in coming to this physical world, from the exalted spiritual domains, was to re-bind and re-allign the separated and lost souls to their original divine source. An embodiment of truth, Guru Nanak was so much intoxicated with the love of God that he lived and exemplified truth in each and every moment of his life. Thus he taught to others what he himself experienced and realized in actual life. 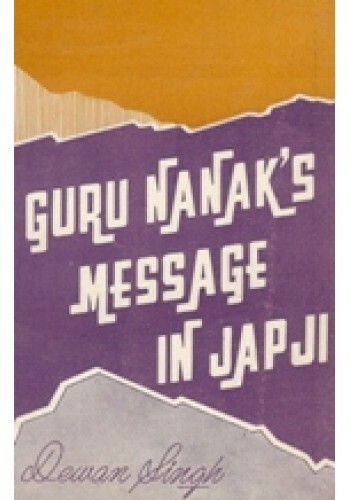 Guru Nanak was a mystic, above all else that can be said about him. 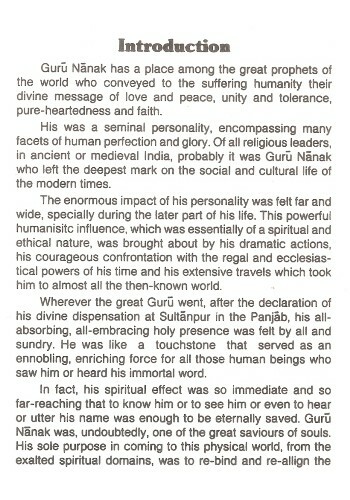 His spiritual realisation and mastery was his real character. There was nothing theoretical or speculative about him. He was all-truth, all-love. 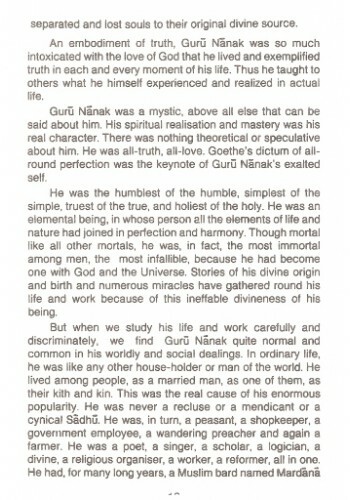 Goethe's dictum of all ­round perfection was the keynote of Guru Nanak's exalted self. He was the humblest of the humble, simplest of the simple, truest of the true, and holiest of the holy. He was an elemental being, in whose person all the elements of life and nature had joined in perfection and harmony. Though mortal like. all other mortals, he was, in fact, the most immortal among men, the most infallible, because he had become one with God and the Universe. Stories of his divine origin and birth and numerous miracles have gathered round his life and work because of this ineffable divineness of his being. But when we study his life and work carefully and discriminately, we find Guru Nanak quite normal and common in his worldly and social dealings. In ordinary life, he was like any other house-holder or man of the world. He lived among people, as a married man, as one of them, as their kith and kin. This was the real cause of his enormous popularity. He was never a recluse or a mendicant or a cynical Sadhu. He was, in turn, a peasant, a shopkeeper, a government employee, a wandering preacher and again a farmer. He was a poet, a singer, a scholar, a logician, a divine, a religious organiser, a worker, a reformer, all in one. He had, for many long years, a Muslim bard named Mardana as his constant companion and friend. He made numerous devotees and disciples during his life-time from among all the classes and creeds of society. 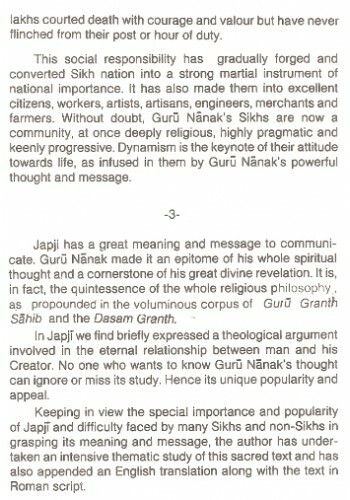 Thus the image of Guru Nanak is the image of an ideal religious preceptor and saviour. 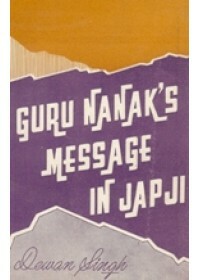 In the' words of his fifth successor, Guru Arjan Dev, I should sum up the character of the great Guru. 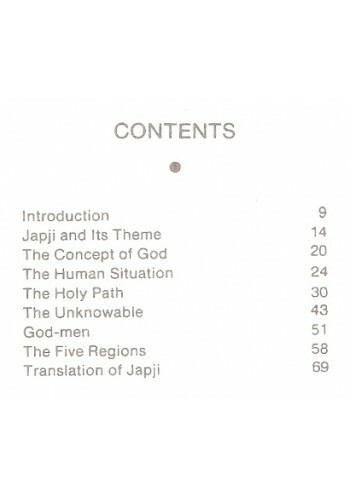 Introduction To The Book 'Islam' By Abdul Haq Ansari , M Mujeeb Islam is a major world-religion w..
Introduction To The Book 'Sukhamani Sahib - Fountain Of Eternal Joy' By Swami Rama Sukh..